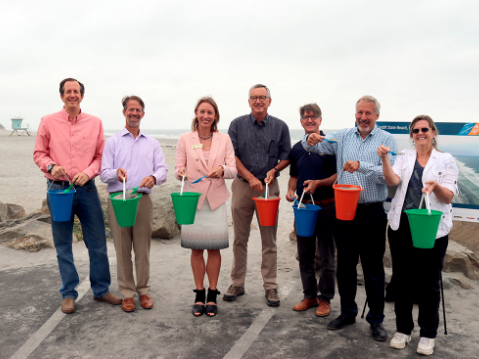 Local elected officials and representatives from SANDAG, Caltrans, the American Shore & Beach Preservation Association, California State Parks- San Diego Coast District, and the San Elijo Lagoon Conservancy, gathered this morning to celebrate the completion of the beach sand replenishment work on Cardiff State Beach in Encinitas and Fletcher Cove in Solana Beach, and a prestigious, nationally-recognized award the team received for beach preservation. Cardiff State Beach is one of five beaches, and the only along the West Coast, awarded as one of the nation's best restored beaches by the ASBPA. Beginning in February 2018, Build NCC construction crews pumped nearly 440,000 cubic yards of sand onto the two north county beaches from the central basin of the San Elijo Lagoon, completing the process to replenish, preserve, and reinforce the shoreline with native, beach quality sand as part of the San Elijo Lagoon Restoration Project and the Build NCC program. By late June, crews demobilized their equipment from the beach just in time for the summer kick off in San Diego County. Before and after photos of Cardiff State Beach. Photos provided by Build NCC. The San Elijo Lagoon restoration is one element of the NCC Program, a 40 year, balanced set of transportation, environmental, and coastal access projects to improve the quality of life for residents, create a stronger local and regional economy for the future, and enhance the coastal environment. The lagoon restoration also is a component of the $850 million SANDAG Environmental Mitigation Program, which was established to provide for large scale acquisition and management of critical habitat areas.